Despite current prioritization of the inclusion of young people's voices in the design and delivery of services for youth and young adults, few up-to-date tools or frameworks have emerged to assist service-providing programs, agencies, or systems in evaluating their efforts. Further, though stakeholders may be on board with the general purpose and principles for including youth and young adult voice in organizations and systems, they may lack awareness of the policies and practices that need to be developed to ensure the consistent and meaningful engagement of youth as participants in decision-making processes. 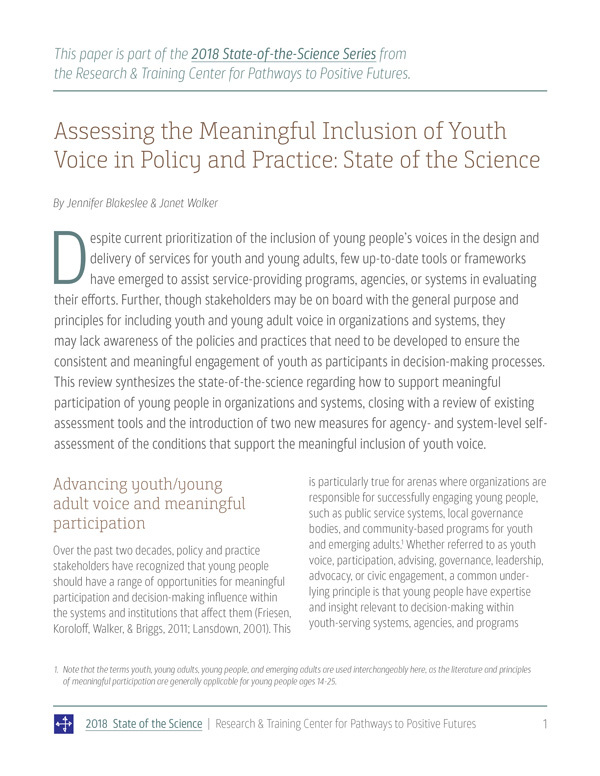 This review synthesizes the state-of-the-science regarding how to support meaningful participation of young people in organizations and systems, closing with a review of existing assessment tools and the introduction of two new measures for agency- and system-level self-assessment of the conditions that support the meaningful inclusion of youth voice. Over the past two decades, policy and practice stakeholders have recognized that young people should have a range of opportunities for meaningful participation and decision-making influence within the systems and institutions that affect them (Friesen, Koroloff, Walker, & Briggs, 2011; Lansdown, 2001). This is particularly true for arenas where organizations are responsible for successfully engaging young people, such as public service systems, local governance bodies, and community-based programs for youth and emerging adults.1 Whether referred to as youth voice, participation, advising, governance, leadership, advocacy, or civic engagement, a common underlying principle is that young people have expertise and insight relevant to decision-making within youth-serving systems, agencies, and programs (Checkoway, 2011; Lansdown, 2001). Further, when adults perceive young people as valuable resources that can inform many of the decisions that impact them, they also see improvement in the quality of the decisions that are made (Zeldin, 2004; Zeldin, McDaniel, Topitzes, & Calvert, 2000). Lastly, opportunities for meaningful youth input can increase youth engagement in organizational activities (Serido, Borden, & Perkins, 2011; Larson, Walker, & Pearce, 2005; Zeldin, 2004). There are a number of mechanisms for including youth voice at the system or organizational level, including youth advisory boards, seats for young people on governance boards, partnerships between youth-led groups and other stakeholders to drive policy change, and employment of young people as youth leaders and ongoing advisors in youth-serving organizations. Recent and prevalent examples include youth councils in municipal government, which can address a range of locally-relevant topics (Checkoway, Allison, & Montoya, 2005; Collins, Augsberger, & Gecker, 2016; Martin, Pittman, Ferber, & McMahon, 2007) and youth-specific engagement as part of a broader community action for policy and systems change (Cooper & Hays, 2007; Luluquisen & Pettis, 2014). A number of public service systems now include youth voice in guiding policy and practice, such as youth advisory boards to involve young people in foster care in decision-making within child welfare systems (Havlicek, Lin, & Villapando, 2016), and youth involvement in system-of-care communities and policy change efforts impacting young people with mental health conditions (Gyamfi, Keens-Douglas, & Medin, 2007; Koroloff, Friesen, & Buekea, 2017). Young people are also involved in grant-making (e.g., Richards-Schuster, 2012) and research and evaluation efforts (e.g., Checkoway & Richards-Schuster, 2003; Koroloff et al., 2010) that inform policy and practice. Importantly, when adult stakeholders invest in structures and processes that meaningfully involve youth voice in organizations and systems, individual young people can accrue relational and developmental benefits from participation itself, in ways that promote both youth and community well-being (e.g., Akiva, Cortina, & Smith, 2014; Larson, Walker, & Pearce, 2005; Zeldin, 2004). For example, a youth advisory board within an adolescent health research center was structured from a youth development framework to ensure it provides opportunities and supports for participation and partnership in leadership and decision-making (Hohenemser & Marshall, 2002). Involving young people in decision-making is also a way to employ positive youth development principles in mental health treatment systems and settings, where young people can be meaningfully involved in service improvement activities—such that their client-based knowledge and insight can improve services for themselves and the broader community of emerging adults—through civic engagement strategies that are widely associated with youth development in general (Walker, 2015). Further, when youth participation in decision-making happens in the program context—"where the operation and governance of the program itself is used as a context for youth learning and development" (Akiva, Cortina, & Smith, 2014, p. 1844)—not only can this impact youth engagement in programming, but youth have the opportunity to develop broader skills (e.g., problem-solving efficacy, leadership). Given the range of potential activities and benefits associated with meaningful youth participation and influence in youth-serving systems, it is important to clarify the strategic organizational outcomes in terms of improved policy and practice. Meaningful participation is not indicated by youth attendance at advisory meetings or engagement events, but by the quality or influence of the participation activity, "such as when people have real effect on the process, influence a particular decision, or produce a favorable outcome. . . [Participation] is the strategy by which they are involved in goal setting, resource allocation, and program implementation" (Checkoway, 2011, p. 341). From this perspective, it is important to consider the interpersonal and organizational conditions that engage and support meaningful participation of young people as stakeholders in the policy and practice decisions that affect them. Several relevant frameworks for facilitating and assessing meaningful participation are reviewed below. While these primarily focus on the organizational level, the principles are largely applicable to inclusion of youth voice at the systems level (e.g., statewide advisory committee for mental health services). One way for organizations to focus on the process and aims of meaningful youth participation is to identify the relational mechanism that facilitates youth contributions to decision-making in a range of contexts. Zeldin and colleagues conceptualize this as youth-adult partnership (Y-AP), defined as "the practice of a) multiple youth and multiple adults deliberating and acting together, b) in a collective [democratic] fashion, c) over a sustained period of time, d) through shared work, e) intended to promote social justice, strengthen an organization and/or affirmatively address a community issue" (Zeldin, Christens, & Powers, 2013, p. 388). In the community program setting, such partnership is "characterized by the explicit expectation that youth and adults will collaborate in all aspects of group decision making from visioning, to program planning, to evaluation and continuous improvement" (Zeldin, Krauss, Collura, Lucchesi, & Sulaiman, 2014, p. 338). Similarly, Y-AP has been framed as a positive youth development practice where young people and adults are "working together to make decisions or take action on important issues in their program, organization, or community" (Akiva & Petrokubi, 2016, p. 248), and where "all individuals have the opportunity to engage in planning, decision-making, and action consistent with their own interests and skill" (Zeldin & Collura, 2010, p. 6). To create a culture of youth participation and partnership, practitioners can facilitate three distinct aims in their community context—voice, decision-making, and leadership—by building positive relationships, engaging youth in first-hand learning, and supporting developmental progression (Akiva & Petrokubi, 2016; Zeldin, Petrokubi, & McNeil, 2008). However, "without clearly delineated examples of how the concept is operationalized in everyday settings" it can be difficult for systems, organizations, and programs to introduce the meaningful participation of young people as an innovative practice (Akiva & Petrokubi, 2016, p. 249). Additionally, it may be difficult to ensure that authentic youth-adult partnership in decision-making is fully installed and sustained as standard operating practice without implementation guidance (Zeldin, Camino, & Mook, 2005). Thus, it has been observed that there is often a large gap between rhetorical commitment and the "less impressive" practice of ensuring youth participation in policy and program arenas, and when this does occur, it is often at lower levels of information gathering from advisory groups of young people, not empowering youth to meaningfully influence decision-making processes or outcomes (Head, 2011). visionary leadership that is committed to change. When facilitators could embody or access such characteristics within the system advisory role, they felt they were able to ensure participation in ways that influenced decision-making outcomes. However, the impact of youth voice as facilitated through the advisory boards was limited by systemic barriers, including tokenism, institutional bureaucracy, lack of high-level buy-in, and the relational challenge of supporting young people who had histories of disempowerment within the system they were advising. The authors argue that in the case of vulnerable or marginalized youth, traditional participation approaches need to account for these more complex aspects of institutional and relational context, which suggests the need for more comprehensive and multi-level guidelines outlining necessary organizational conditions and best practices to ensure meaningful participation of these young people in large organizations and public systems. Organization/system-level practices promoted a favorable environment for youth leadership (e.g., adopting a youth-led philosophy, seats for youth on the board). Explicating the adult role in supporting and/or structuring youth-led processes at different levels underscores the dynamic nature of power-sharing with young people, which is expected to involve ongoing adaptability and responsiveness to youth strengths and needs, as well as regular negotiation of multi-level tensions within and between the youth-led group, the program or setting staff, and the broader organizational administration (Blanchet-Cohen & Brunson, 2014). institutionalize new roles for youth (Zeldin, Camino, & Mook, 2005). In addition to a multi-level understanding of youth participation, implementation requires a multi-stage mindset. Head (2011) points to the broad framing of participation promotion as providing "openings, opportunities, and obligations" (Shier, 2001) facilitating various levels of youth involvement, where the "process of commitment" (Head, 2011) has three stages. The first is the awareness of youth participation as a desired outcome, then the securing of resources and skills to achieve that level of participation, followed by the development of operating procedures to maintain the participation. In this framing, investing in meaningful participation is an ongoing, iterative process that allows for multiple entry points for youth to be involved in organizational advising to various degrees, based on regular consideration of the appropriateness and feasibility of meaningfully involving young people in a particular decision-making area (Schier, 2001). How We Do Business: build a sense of shared ownership among stakeholders, leveraging infrastructure, role identification, and collective story. Importantly, this implementation framework reflects the experiences of trained facilitators working with county-level staff and administrators to introduce meaningful youth participation in public systems. Thus it reflects a multi-level effort to build awareness, secure resources, and maintain commitment for a range of approaches to involve youth in decision-making (not limited to creating youth advisory boards, for example). This also underscores the importance of the identified staff role responsible for implementing and sustaining meaningful youth participation, which may require a range of professional skills, including the ability to strategically push adult stakeholders out of their comfort zones in ways that allow for young people to have some power and influence within the system (Zeldin et al., 2008). The overview of frameworks for understanding the multi-level, multi-stage nature of the implementation of youth participation as an innovative practice, especially in public service systems, suggests that administrators and staff in such settings need to embrace meaningful youth participation as "the way we do business." To assist with this process, they can assess the extent of their own understanding, commitment, capacity, and supportive practices to ensure young people consistently have a voice in decision-making. However, there are few assessment tools available to evaluate dimensions of meaningful youth participation—whether at the individual, program, organization/agency, or system level—and fewer still that have been validated as reliable and relevant measurement instruments. One validated self-assessment tool, the Youth Program Quality Assessment (YPQA), measures overall program quality in terms of best practices for engaging youth in the program environment (The Forum for Youth Investment, 2012; Smith & Hohmann, 2005); the Youth PQA Form B specifically assesses organization supports for youth program offerings in terms of youth-centered policies and practices, high expectations for youth and staff, and access (FYI, 2012). There are two practice-friendly tools that specifically measure youth-adult partnership, but the organizational-level measure has not yet been validated. First, the validated Youth-Adult Partnership (Y-AP) scale measures the Y-AP concept in community programs (Zeldin, Krauss, Collura, Lucchesi, & Sulaiman, 2014). The 9-item scale measures supportive adult relationships (e.g., Youth and staff trust each other in this center/program) and youth voice in decision-making (e.g., The staff take my ideas seriously). The measure is completed by youth to evaluate Y-AP in a particular program setting, and demonstrated strong validity on the two subscales (Zeldin et al., 2014). Additionally, adults working within youth programs or settings can use the Y-AP Rubric (Wu, Weiss, Kornbluh, & Roddy, 2014) to assess dimensions of support for Y-AP (authentic decision-making, natural mentors, reciprocity, and community connectedness) for program evaluation and improvement (Wu, Weiss, Kornbluh, & Roddy, 2014). However, although the rubric is based on Y-AP research and was developed in partnership with young people, it has not yet been formally validated as reliably measuring the concepts of interest. Thus, while these existing measures have some formal validation for assessing some aspects of perceptions of youth participation, there is still a need for a comprehensive self-assessment of the meaningful inclusion of youth/young adult voice in policy and practice at both the organizational and system levels. Further, these assessment tools need to be validated both for research purposes, such as evaluation of large-scale initiatives to increase youth voice across multiple organizations or systems, as well as for practice improvement purposes, in terms of providing direct guidance about specific practices that could be implemented or further developed in individual agencies or systems. Therefore, researchers at Portland State University have developed two new assessment tools in partnership with Youth MOVE National, and are in the process of establishing measure reliability and validity for both. The first, the Youth/Young Adult Voice at the Agency Level assessment (Y-VAL), was developed and validated in partnership with young people and representatives of organizations working to promote meaningful participation of youth and young adults in agency-level advising and leadership activities, and is intended to help such organizations to conduct self-assessment and to identify areas for additional technical assistance. To do this, the Y-VAL assesses the extent to which organizations have installed a comprehensive array of best practice strategies to support meaningful youth and young adult participation and voice in advising and decision-making at the organizational level. This includes a range of activities, from mechanisms to initially engage young people (such as youth leadership groups), to best practices for including young people in advising and decision-making for planning and evaluation purposes within the agency, and activities that support ongoing youth skill development (e.g., peer-support roles, youth leaders as paid staff). The Y-VAL measures the presence of multiple supportive policies and practices within eight critical themes or dimensions (e.g., overall vision and commitment, collaborative approach, empowered representatives, workforce development) and provides a description of what fully-developed organizational investment in meaningful youth participation looks like for the specific policy or practice dimension. The Y-VAL self-assessment is intended to be relevant for a variety of organizations that serve youth and young adults. The second tool, the Y-VOC (Youth/Young Adult Voice on Councils/Committees) is currently being finalized and validated for eventual use in the field. The Y-VOC is similar to the Y-VAL in assessing a range of supportive policies and practices for the inclusion of young people on committee and council advising systems. Although the inclusion of young people on system-level advisory groups is becoming a widespread practice, the Y-VOC is expected to be the first validated system-level measure of support for the meaningful inclusion of young people's voice in these decision-making bodies. Note that the terms youth, young adults, young people, and emerging adults are used interchangeably here, as the literature and principles of meaningful participation are generally applicable for young people ages 14-25. Akiva, T., Cortina, K.S., & Smith, C. (2014). Involving youth in program decision-making: How common and what might it do for youth? Journal of Youth and Adolescence, 43(11), 1844-1860. Akiva, T., & Petrokubi, J. (2016). Growing with youth: A lifewide and lifelong perspective on youth-adult partnership in youth programs. Children and Youth Services Review, 69, 248-258. Blanchet-Cohen, N., & Brunson, L. (2014). Creating settings for youth empowerment and leadership: An ecological perspective. Child & Youth Services, 35(3), 216-236. Checkoway, B. (2011). What is youth participation?. Children and Youth Services Review, 33(2), 340-345. Checkoway, B., Allison, T., & Montoya, C. (2005). Youth participation in public policy at the municipal level. Children and Youth Services Review, 27(10), 1149-1162. Checkoway, B., & Richards-Schuster, K. (2003). Youth participation in community evaluation research. American Journal of Evaluation, 24(1), 21-33. Collins, M.E., Augsberger, A., & Gecker, W. (2016). Youth councils in municipal government: Examination of activities, impact and barriers. Children and Youth Services Review, 65, 140-147.
Cooper, D.G., & Hays, S.P. (2007). Engaging youth for positive change: A critical analysis of case studies on local action. Children Youth and Environments, 17(2), 433-453. Forum for Youth Investment (2012). Youth Program Quality Assessment – Form B Organization Items, Subscales V-VII (Ypsilanti, MI: High/Scope Press). Friesen, B.J., Koroloff, N.M., Walker, J.S., & Briggs, H.E. (2011). Family and youth voice in systems of care. Best Practices in Mental Health, 7(1), 1-25. Gyamfi, P., Keens-Douglas, A., & Medin, E. (2007). Youth and youth coordinators' perspectives on youth involvement in systems of care. The Journal of Behavioral Health Services & Research, 34(4), 382-394. Havlicek, J., Lin, C.H., & Braun, M.T. (2016). Cultivating youth voice through participation in a Foster youth advisory board: Perspectives of facilitators. Children and Youth Services Review, 69, 1-10. Havlicek, J., Lin, C.H., & Villapando, F. (2016). Web survey of foster youth advisory boards in the United States. Children and Youth Services Review, 60, 109-118. Head, B.W. (2011). Why not ask them? Mapping and promoting youth participation. Children and Youth Services Review, 33, 541-547. Hohenemser, L.K., & Marshall, B.D. (2002). Utilizing a youth development framework to establish and maintain a youth advisory committee. Health Promotion Practice, 3(2), 155-165. Koroloff, N., Friesen, B., & Buekea, N. (2017). Changing the rules: A guide for youth and young adults with mental health conditions who want to change policy. Portland, OR: Research and Training Center for Pathways to Positive Futures, Portland State University. Koroloff, N.M., Osher, T., Jivanjee, P.R., Pullmann, M., Sofich, K., Guthrie, L., ... & Murphy, S. (2010). Under new management: Research collaboration with family members and youth. Children's Mental Health Research: The Power of Partnerships, 40. Lansdown, G. (2001). Promoting children's participation in democratic decision-making. Florence, Italy; UNICEF Innocenti Research Centre. Luluquisen, M., & Pettis, L. (2014). Community engagement for policy and systems change. Community Development, 45(3), 252-262. Martin, S., Pittman, K., Ferber, T., McMahon, A. (2007). Building effective youth councils: A practical guide to engaging youth in policy making. Washington, D.C.: The Forum for Youth Investment. Richards-Schuster, K. (2012). Empowering the voice of youth: The role of youth advisory councils in grant making focused on youth. New Directions for Evaluation, 2012(136), 87-100. Serido, J., Borden, L.M., & Perkins, D.F. (2011). Moving beyond youth voice. Youth & Society, 43(1), 44-63. Smith, C., & Hohmann, C. (2005). Full findings from the Youth PQA validation study. Ypsilanti, MI: High/Scope Educational Research Foundation. Wu, H.J., Weiss, J., Kornbluh, M., & Roddy, L. (2014). Youth-adult partnership rubric: A tool for professional development and program evaluation in youth settings (Version 1.0). Zeldin, S., Camino, L., & Mook, C. (2005). The adoption of innovation in youth organizations: Creating the conditions for youth–adult partnerships. Journal of Community Psychology, 33(1), 121-135. Zeldin, S., Christens, B.D., & Powers, J.L. (2013). The psychology and practice of youth-adult partnership: bridging generations for youth development and community change. American Journal of Community Psychology, 51(3-4), 385-397. Zeldin, S., & Collura, J. (2010). Being Y-AP Savvy: A primer on creating and sustaining youth-adult partnerships. Ithaca, NY: ACT for Youth Center for Excellence. Zeldin, S., Krauss, S.E., Collura, J., Lucchesi, M., & Sulaiman, A.H. (2014). Conceptualizing and measuring youth–adult partnership in community programs: A cross-national study. American Journal of Community Psychology, 54(3-4), 337-347. Zeldin, S., McDaniel, A.K., Topitzes, D., & Calvert, M. (2000). Youth in decision-making: A study on the impacts of youth on adults and organizations. Chevy Chase, MD: National 4-H Council. Zeldin, S., Petrokubi, J., & MacNeil, C. (2008). Youth-adult partnerships in decision making: Disseminating and implementing an innovative idea into established organizations and communities. American Journal of Community Psychology, 41(3-4), 262-277. Blakeslee, J. (2018). Assessing the Meaningful Inclusion of Youth Voice in Policy and Practice: State of the Science. Portland, OR: Research and Training Center for Pathways to Positive Futures, Portland State University.